We’re celebrators and custodians of the Columbia region, its heritage, and its culture. CRRPress expands that mission. We’re creating new content and distributing a few select books that support our mission and reflect our readers’ interests and passions. We’re thrilled to kick off CRRPress featuring three books by Rex Ziak, who makes history come to life and revolutionizes regional scholarship. We intend to publish two to four new and distributed titles each year. All book orders include $3.90 shipping/handling charge. Book orders and subscriptions delivered to Washington State addresses are subject to applicable sales tax. Anyone from outside the US, please email us at publisher@crreader.com for your custom order. Receive your copies (11 Issues) by mail for $55 per year, plus applicable WA state sales tax. 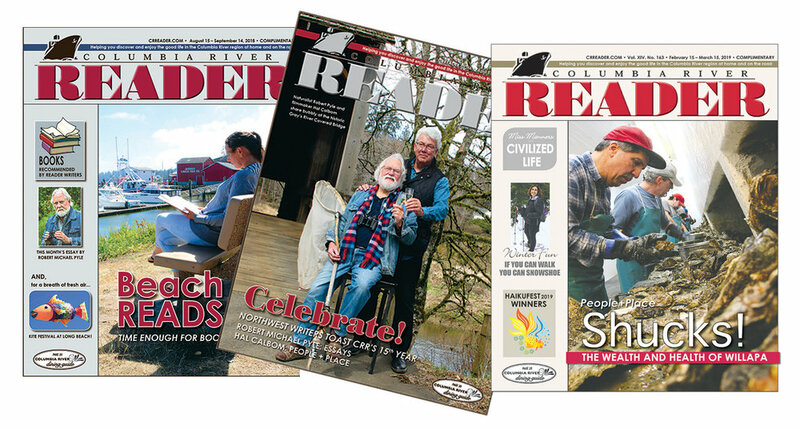 Pay online or mail your check to Columbia River Reader, PO Box 1643, Rainier, OR 97048. (Buy now - Click here) and never worry about missing an issue! Announcing a special subscription program which includes a host of other benefits to membership, including special events and author access, book signings and readings, as well as the convenience and efficiency of monthly home delivery. The newly edited and annotated by Rex Ziak version of Franchére’s 1820 journal, Narrative of a Voyage to the Northwest Coast of America in the Years 1811, 1812, 1813 and 1814, or The First American Settlement on the Pacific. A unique fold-out guide mapping day-by-day Lewis and Clark’s journey from the Rockies to the Pacific Ocean and back.